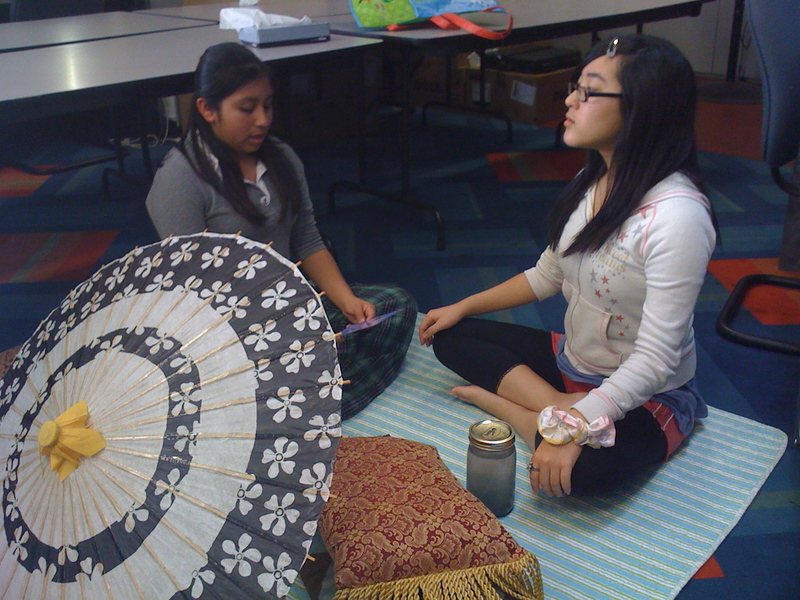 The final installment in a series of 5 posts on teaching mindfulness to youth. These techniques are geared especially for youth ages 11-15 years. Increased and prolonged focus evidenced by less fidgeting and more stillness. It is not necessary that students stay perfectly still, but look for students to cease extraneous movements. Students ability to keep attention within own “space.” As students become more adept, they will be able to maintain a more steady gaze, or keep eyes closed, rather than looking around at classmates. The culmination of these steps are found in the following mindful awareness exercise written as a script for you to read. Please sit on the floor or in a chair. If you are seated on the floor, please cross your legs and find an easy, steady position for your body. If you are in a chair, place both feet on the floor if possible. Place your hands gently on your thighs with your palms turned down. For the next few moments, pay attention to your body. Allow your body to settle into this position. Feel the soles of your feet, relax them. Let your legs be heavy. Feel your sitting bones grounded on the floor or in the chair. Feel that you have a steady, stable seat in this position. Now, please bring your awareness to your center. Let your belly move with your breath. Allow your belly to be soft and relaxed, yet still supportive of your back. Find your tailbone rooting into the Earth and begin to draw length up through your entire spinal column. Gently draw your shoulder blades onto your back, so your chest is uplifted. Feel the crown of your head quietly reaching toward the sky. Now, relax your face. If it feels right to you, close your eyes or gaze softly at one spot. Relax your jaw. Allow your shoulders to soften a bit. Feel the energy in the palms of your hands. Now, please listen to the sounds around you. If you are inside, listen for the sounds coming from outside of the room. If you are outside, listen to the sounds around you. When you hear a sound, notice what that sound is, then listen for other sounds. Now, listen for sounds happening closer to you… in the room, or right around you. Notice the sounds you hear, then listen for other sounds. Now, listen to any sounds happening in your body. Begin to notice any sensations in your body. When you notice a feeling, be aware of what the feeling is and then move your awareness to other feelings in your body. Now, bring your attention to your breathing. Let’s count 5 breaths together. Now count your own breath. Start with the number one. When you notice that you have lost count, simply start over again at number one. With practice, you’ll be able to stay with your breath for longer. Begin counting now. (pause for 1-2 min). Notice what number you are on now. Bring your awareness back to your body. Listen for any sounds around you. And, slowly open your eyes and bring your attention back to the space around you. You can use the breath counting meditation anytime you need to connect to yourself and your life. *** An audio version is available on Shanti Generation’s Yoga Skills for Youth DVD. Valentine’s Day reminds us of the importance and joy of reaching out to our loved ones and letting them know we care. Fortunately, there is a growing movement in education to extend this practice beyond the calendar holiday and into the daily lives of students in schools. As my Valentine to you, I am excited to share a sampling of resources I have discovered in my research on the subject of Social and Emotional Learning (SEL). For parents, teachers and community members who wish to make an impact on the climate in local schools, there is growing support. Here are a few places to start. A process for helping children and even adults develop the fundamental skills for life effectiveness. SEL teaches the skills we all need to handle ourselves, our relationships, and our work, effectively and ethically. when angry, make friends, resolve conflicts respectfully, and make ethical and safe choices. How do we know SEL works? The movement to implement SEL in schools is not based on speculation. To the contrary, scientists and education theorists have been hard at work over the past decade researching the far reaching benefits of SEL. For a powerful and inspiring primer on the extensive body of research, enjoy the following interview with psychologist, Daniel Goleman, author of Emotional Intelligence. What does SEL have to do with Yoga? Practicing yoga deepens self awareness and enhances our ability to self care, both fundamental aspects of SEL. In this month’s Yoga Journal, Trudie Styler (wife of Sting), says yoga practice ” is an exercise in listening…it teaches you to tune in to your relationships.” The ability to listen deeply is essential to developing empathy, another core component of SEL. While most dedicated practitioners of yoga will enjoy these benefits if studying with a qualified teacher, in my experience, these benefits are greatly enhanced in yoga classes for adolescents due to the nature of class experience. Time spent in dialogue, journaling and self-expression help youth discover ways to transfer their yoga education into daily life situations. For folks interested in learning more about the connections between yoga and SEL, Shanti Generation’s Yoga Skills for Youth Facilitator’s Training offers a well spring of experiential learning on the topic. We have trainings coming up in Los Angeles and New Orleans. Here, I would like to honor a few of the individuals who have courageously carved the path toward Social and Emotional Learning in schools. There are way too many incredible leaders in the field to mention here. In closing, I’d like to pay tribute to one last trailblazer the movement lost this year, Rachel Kessler (1946-2010). Kessler’s The Soul of Education is an excellent book that is sure to upgrade anyone’s knowledge of SEL. A new era of care and compassion in the classroom is coming. I am heartened by the many ways that yoga can help teachers and parents achieve our goals for creating harmonious, loving environments for our youth. 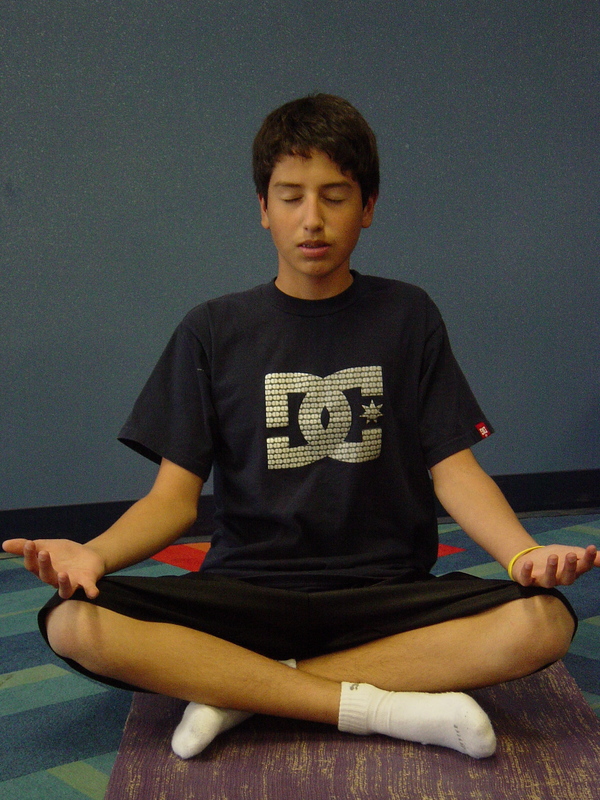 Part Four in a series of 5 posts on teaching mindfulness to youth. These techniques are geared especially for youth ages 11-15 years. 1. Create a “mindful experience” using the environment in which you teach. This gives youth a reference point for what mindfulness is. Now to step four, following the breath, which requires a more refined level of attention. First, establish a steady, comfortable seated or laying down posture. Remember, in these beginning stages, allowing students to be physically comfortable will allow them to work more readily with their attention. If laying down, create a symmetrical position with the body. If sitting, uplift the spine, without too much fuss. Sitting against a wall may help. Once the basic understanding of mindfulness is in place, a more aligned physical posture can be assumed. Begin to breathe in and out through the nose, if possible. Otherwise, breathe through the mouth. Follow each inhalation into the body. Be curious about where the breath travels in the body. Notice the end of the inhalation. Follow the exhalation out of the body. Notice the end of the exhalation. This is one cycle of breath. Begin to count each cycle of breath. One inhale and one exhale equals one breath. It helps to count at the end of each breath cycle. Continue counting for the entire exercise. Let students know that if they realize they have lost count, no problem, simply start over again at one. This is not a contest, it is am experiment to see how long your mind can focus on the breath. Seems simple, right? Well, if you have never tried, go ahead and give it a go. While the other parts of learning mindfulness techniques involve random factors such as unexpected sounds and sensations, following the breath is monotonous and fairly uneventful, at first. For adolescents, staying with the breath can be very challenging. One tip to get started, borrowed from one of my dear teachers Sue Elkind, is to ask students to count their breath down from 10. This gives a clear beginning, middle and end to the process. Once this way is practiced several times, the counting from one upward may be more accessible. Practice the counting for 3-5 minutes in the beginning. When time is up, ask students to notice the number they are on and bring them back to the room gradually. Have them notice the support of the floor beneath them and the air around them. Open the eyes if they were closed and look around. Asking students to state their number of counted breathes out loud can give skewed results as students tend to want to be within the same realm as their peers. Have students write their name and number on a small post-it note and turn it in to you. This will give you some indication of your students process in this technique. When moving into more refined mindfulness techniques such as this one, two factors are critical. Number one, only teach what you know. Take on this practice yourself, preferably with an experienced teacher. Number two, remember that this is a practice of training the mind’s attention. Most people lose focus easily in the beginning. What matters most is that one notices when the attention has strayed and starts back at one. Starting back at one is a good thing! It means you are becoming aware of your mind. Part Three in a series of 5 posts on teaching mindfulness to youth. These techniques are geared especially for youth ages 11-15 years. Adolescence is a time of constant, drastic physical changes. It is common for pubescent youth to feel overwhelmed and confused about their transforming bodies. Mindfulness practices offer youth the opportunity to relate with their bodies in ways that can increase awareness and promote positive body image. The following technique asks youth to consciously observe and feel the sensations in their bodies. Step One: Lay down in a comfortable, symmetrical position. Close the eyes gently or gaze at one spot. Spend a few minutes relaxing the body from toes to head. Become aware of the inhalation and exhalation, slowly deepening each breath. Step Two: As the body and mind begin to settle, observe the sensations in the body. At first it may be difficult to focus the mind on the body. If the mind wander, gently guide it back to the body using the inhale. Notice the feelings on the surfaces of the body. As you notice a sensation, mentally note it. For example, if you feel an itch, note “itch” in your thoughts. Then, continue to scan the body and notice other sensations. Step Three: Move your awareness to the internal body now. Sense the pulsation of the heartbeat. Continue to make mental notes of the sensation. Explore the sensations in the belly region, back and head. Observe and make mental notes for 4-6 minutes to start. Step Four: Bring the attention back to the breath. Follow the inhale and exhale for 10 cycles. Feel the floor supporting the body and the space all around. Slowly open the eyes, bringing the attention into the surrounding room. After this exercise, let students share their observations with a partner or journal about their experience. Remind students that it is not necessary to judge the sensations of the body, that simply being with the feelings is the goal. Subscribe to our new blog! Migrate with us, won’t you? Shanti Generation blog has moved.